Qualcomm announced Quick Charge 4 with the unveiling of the Snapdragon 835 at the beginning of the year and now it brings a more polished version of the standard. Its name is Quick Charge 4+ and should be considered as an update to the previous standard since both can be used on the same chipset. 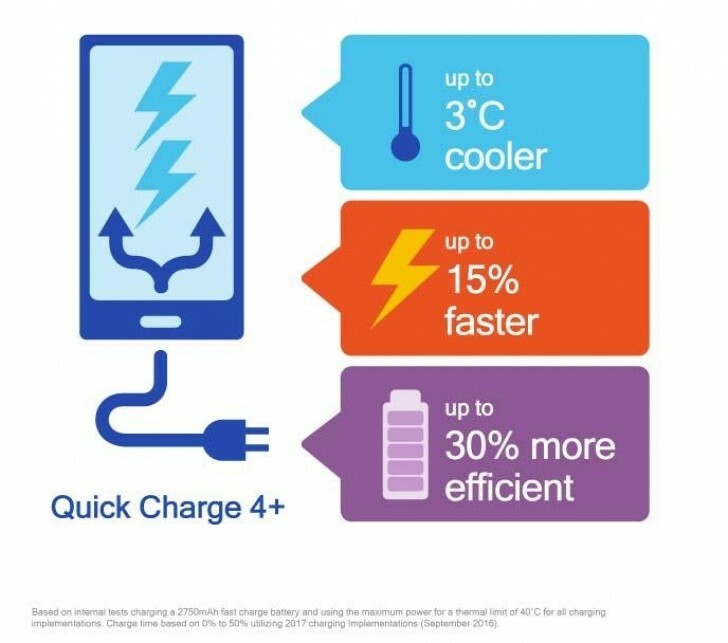 Quick Charge 4 devices can switch to QC4+ if manufacturers decide to include three enhancements. Dual Charge is similar to an earlier version of Quick Charge, but now Qualcomm says it is “more powerful”. There is also Intelligent Thermal Balancing that steers current through the less used charging pathway to keep temperatures of the chipset and the device down. The third enhancement is called Advanced Safety Feature that monitors both the phone and the connector temperature to prevent overheating and short-circuit damage. The San Diego Company says devices that support QC4+ will charge 15% faster and 30% more efficiently. Charging would also be up to 3 degrees Celsius cooler. Quick Charge 4+ is not a software update, but a hardware upgrade, so you can’t just get it with a patch. The only device right now on the market that supports the new standard is the ZTE nubia Z17 that was announced yesterday.